Why Do We Dress Up and Get Candy at Halloween? Have you ever wondered where this crazy tradition of Halloween came from and why we go around scaring each other and collecting candy? Me too, so I did some research. The dictionary defines Halloween as “October 31, the eve of All Saints Day, celebrated in the United States, Canada, and the British Isles by children going door to door while wearing costumes and begging for treats and playing pranks.” We know it as a time when families carve pumpkins; decorate their home with deathly props and kids happily collect big sacks of candy. But how did Halloween come to be? Some believe it is stemmed in religion but actually, its origins are pagan, dating back to the ancient Celts in Ireland and the Druids in the United Kingdom (you know, the dudes who built Stonehenge). 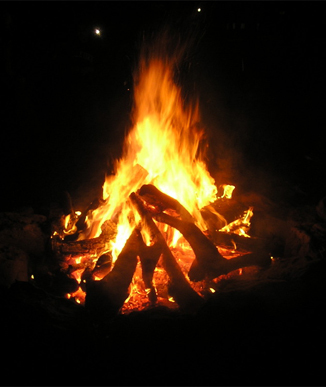 October 31 marked the end of the Druid calendar while November 1 marked the day they celebrated the Feast of Samhain. This was the one day of the year they believed there was no boundary between the living and the dead. Samhain was the great God of Death, who on October 31st would conjure up all the wicked souls who had died during the year. These wicked souls were believed to be roaming around in the bodies of animals as punishment for there evil deeds. Fearing these spirits would try to possess their bodies to reassume human form, the people built and burned giant bonfires to frighten the spirits away. The people dressed in frightening animal skins so the evil spirits might mistake them for one of their own. They also made animal and human sacrifices to further prove their point to the evil spirits that they weren’t kidding around. While the huge bonfire was burning, the Druids would extinguish the hearths in their homes and leave food on the doorstep in an attempt to prevent evil spirits from coming inside their houses. This is probably where the idea of give a treat first came into play. Some time later when the Romans conquered the Celtic Territories, they celebrated a similar holiday on November 1st to honor Pomona, the goddess of orchards and fruit trees. This holiday celebrated the end of the harvest season and the passing of the dead. The Romans would build great bonfires and roast apples and nuts to honor Pomona. This day was called Feralia. Till that time, the Romans worshiped pagan gods. When the Romans began to adopt Christianity this celebration became a no-no. Paganism doesn’t fly with the Roman Catholic Church so to make the holiday more their own and further recruit followers of Christianity, the pope named November 1st All Saints Day to honor those who have passed. Therefore the day before was named All Souls Day, a day when Christians were asked to pray for the souls of the departed. This prayer would allow the souls in Purgatory to be cleansed of their sin and granted entrance into Heaven. Part of the tradition of All Souls Day was to leave an offering of food on their tables for the souls to share the feast (again, the reference to giving of treats). The Christians also lit candles in memory of their dead. All Souls Day was also referred to as All Hallows Eve and eventually, Halloween. Today, Halloween is considered a secular holiday. Ghost stories and spooky props are for pure entertainment. The ghoulish and ghostly costumes meant to scare away evil spirits have given way to a variety of Halloween costumes from horror to humorous. Many children would much rather dress as a favorite superhero or television character. Today, no matter what they wear, the Halloween really boils down to one thing: Dressing up for CANDY, and lots of it!